Density 35 - 40 Kg/Sq mtr. We "SRG International" are manufacturing high quality of Roofing PUF Panels with PUF insulation in between this panel provide best in class insulation and durable. Puff Roofing panels are modern technique to building sheds, ware house, and also used any many roofing activity. SRG offer wide range of options for architect and designer for roof cladding and wall cladding. 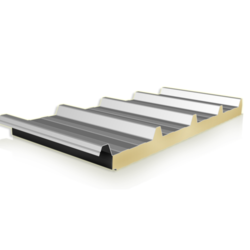 Our Puf insulated roofing sheets is designed to provide highest level of thermal insulation and performance its has structural integrity and it is also damage resistance. 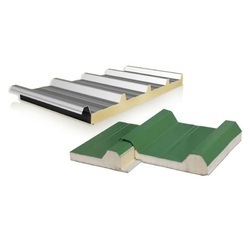 SRG roofing insulated sheets also greatly reduce on-site fixing costs as compared to any conventional wall or roof cladding and also provides better and safe working platforms. 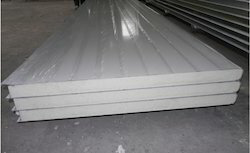 Sandwich PUF Panels are used for insulation of roofing and walling in the building industry. Sandwich puf panel means both side metal sheet and insulation in between.They are used alongside traditional building materials such as wood, steel and concrete and have become the first choice material for the realization of various buildings. 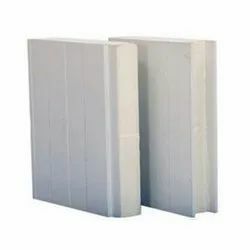 We are a professionally managed company engaged in manufacturing of PUF Panels. We operate from a very modern manufacturing unit, using modern processes to guarantee consistency and reliability, we have ample facilities and technically sound workforce for manufacturing any type of PUF panels. Customers can avail these Panels according to there requirements. Sandwich Panels are used for insulation of roofing and walling in the building industry. 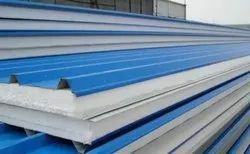 Sandwich puf panel means both side metal sheet and insulation in between.They are used alongside traditional building materials such as wood, steel and concrete and have become the first choice material for the realization of various buildings. We "SRG International" are a professionally managed unit engaged in manufacturing of PUF Insulated Panels. We operate from a very modern manufacturing unit, using modern processes to guarantee consistency and reliability, we have ample facilities and technically sound workforce for manufacturing any type of PUF panels. Our production facility is proliferated with comprehensive setup for designing, quality checking and sampling. These Panels are available in thickness form 30 mm to 150 mm. Our standard density of puf is 40 kgm. Customers can avail these Panels according to there requirements. Production Capacity: 1000 Sq. Mtr. We "SRG International" are a professionally managed unit engaged in manufacturing of Polyurethane Insulation Panels. We operate from a very modern manufacturing unit, using modern processes to guarantee consistency and reliability, we have ample facilities and technically sound workforce for manufacturing any type of PUF panels. Our production facility is proliferated with comprehensive setup for designing, quality checking and sampling. These Panels are available in thickness form 30 mm to 150 mm. Our standard density of puf is 40 kgm. 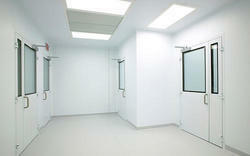 Customers can avail these Panels according to there requirements. We are considered in the market to be one of the leading manufacturers and suppliers of these Puf Panels. For the purpose of living up to this reputation, we use finest raw materials and modern machinery. Finding their application in several industries, for the purpose of building roofs and walls, their preference in the market is quite high. anufactured in compliance with the set industrial norms and guidelines, the offered Prefabricated Puf Panel quality is never compromised. The high-quality raw materials used in its making, gives the panels a commendable structure, superior strength and extraordinarily long life. 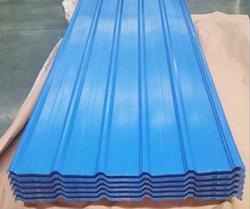 It is used widely for building roofs and walls in several industries. Made available to clients at the best rate possible, these Polyurethane Foam Puf Panel have a high preference in the market. Used for the purpose of making water & heat proof roofs and walls, the performance it provides is impeccable in nature. The finest raw materials and modern machinery used in its making give it superior strength and a longer service life. We are offering a wide range of Wall Cladding PUF Panel. Wall cladding is an encompassing term for the exterior surface of a building, which protects the from covering against moisture and foreign elements. 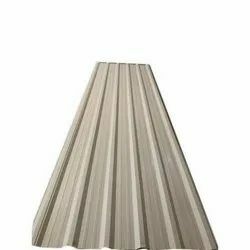 These can be used as single skin roof or wall cladding or can be used in combination with insulation to give thermal and acoustic characteristics. Our entire range of these brick wall cladding is put to comprehensive quality testing phase under the guidance and strict supervision of the clients. 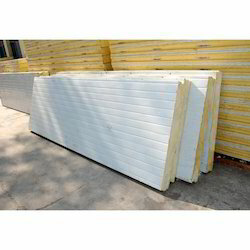 We are one of the leading manufacturers & suppliers of PUF Partition Panel. 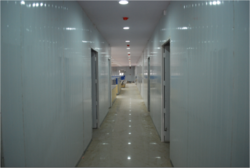 Prefabricated Panels in various materials from pre-coated, G. I. S. S. either on both sides or two different materials inside and outside are of Sandwich type information and available in standard, modular lengths to suit the requirement.